Further to our newsletter last year, Notice 2018–01 was issued by the IRS on January 16 to notify the public that, starting this month, it will implement new procedures that will affect taxpayers with “seriously delinquent tax debts.” The implementation of these procedures could significantly curtail the ability of Americans with seriously delinquent tax debts to work, live, and travel overseas. The IRS is required under IRC § 7345, as enacted by Section 32101 of the Fixing America’s Surface Transportation Act of 2015 (the “FAST Act”), to notify the State Department of taxpayers whom the IRS has certified as owing a seriously delinquent tax debt. The FAST Act also requires the State Department to deny such individual’s passport application or renewal of the passport. The State Department may even revoke an existing passport in some cases. It was reported last year that the IRS was ready to go but the State Department was preparing itself to enforce these rules. A taxpayer with a seriously delinquent tax debt is generally someone who owes the IRS more than $51,000 (for 2018, indexed for inflation) of accumulative assessed tax debts, including interest and penalties, for which the IRS has filed a Notice of Federal Tax Lien and the period to challenge it has expired or the IRS has issued a levy. Has collection suspended because a taxpayer has made an innocent spouse election or requested innocent spouse relief. The IRS will not, however, reverse certification where a taxpayer requests a collection due process hearing or innocent spouse relief on a debt that is not the basis of the certification. Also, the IRS will not reverse the certification because the taxpayer pays down the debt to below $51,000. The IRS is bound by the statute to contemporaneously notify the taxpayer when such individual is the subject of a certification or reversal of a certification. This means the taxpayer being certified may only be notified at same time, not before, the State Department is sent the certification. Notice CP508C, “Notice of certification of your seriously delinquent federal tax debt to the State Department” will be issued to certified taxpayers with a description, in simple nontechnical terms, of the right to bring civil suit in either a United States district court or the United States Tax Court. If a court determines that the certification was erroneous, the court may order the IRS to notify the State Department that the certification was erroneous. When a certified taxpayer applies for a new or renewal of passport, the State Department, in general, will provide the applicant with 90 days to resolve their tax delinquency before denying the application. 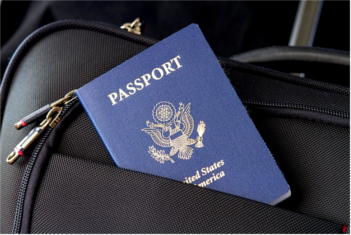 If a taxpayer needs the passport to travel within those 90 days, the taxpayer must contact the IRS and resolve the matter within 45 days from the date of application so that the IRS has adequate time to notify the State Department. Given the complexity of these cases, the holding period may not, in reality, allow sufficient time for taxpayers to resolve or contest their tax debts with the IRS. According to the 2017 Annual Report to Congress, prepared by the Taxpayer Advocate Service (“TAS”), an independent organization within the IRS, an estimated 270,000 taxpayers could be in scope, based on figures available as of October 2017. During the initial implementation of the program, approximately 2,700 taxpayers are expected to be certified by the IRS, which plans to issue additional certifications in phases throughout 2018, depending on taxpayer response rates. While the IRS does not intend to recommend revocation of passports at this stage, the TAS reports, the State Department may still revoke passports in accordance with its own procedures. Since this will essentially involve multiple notices, taxpayers should have ample opportunities to resolve such debts with the IRS by contesting any erroneous assessments or arriving at an installment agreement or offer-in-compromise. Even if a taxpayer is not able to settle the tax debt in full immediately, it would be important to respond to IRS notices by the applicable deadlines and keep the dialog going until a resolution is reached. Expatriates working or living overseas should ensure the IRS has their up-to-date correspondence address on file. Taxpayers who changed address after a tax return is filed may notify the IRS of the new correspondence address by filing a Form 8822. In general, taxpayers behind on their tax obligations should rectify any such delinquency as early as possible. Not only will interest and penalty charges continue to accrue on any balance due, the statute of limitations for IRS to assess and collect any outstanding balances does not start until a return has been filed. In other words, there is no statute of limitations for assessing and collecting the tax if no return has been filed. Expatriates whose compensation from foreign employment is no more than the allowable foreign earned income and housing exclusions sometimes mistakenly presume that they are not required to file a U.S. tax return without realizing certain conditions must be met in order for their compensation to be excluded, in part or in full, and that they may even lose the eligibility for the exclusions if an election is not made within the timeframe in the manner prescribed by the regulations 1. In addition to tax filing, there are adverse tax consequences and penalty provisions related to delinquent information returns, such as FBAR, which applies to most expatriates due to the low threshold for aggregate account balance. Taxpayers with delinquent tax or information returns are advised to consult a qualified tax professional to assess their filing requirements and remedial actions to be taken.